When employing staff it is very important to get the employment contract correct to ensure you meet all the requirements of employment law, but also to ensure you retain the maximum amount of flexibility for your business. You will need to decide whether the job you are offering is ongoing and of indefinite duration, or whether it comes to an end on a fixed-date or after a particular event (e.g. the return of an employee from maternity leave). If you are confident the role is ongoing, you can offer a permanent employment contract . If the job is likely to run out at a certain point, then a fixed-term employment contract would be the option to go for. Either could be used for full or part-time staff. If the most important thing is flexibility, then a zero-hours contract will ensure you only have to pay for the hours when you need your staff to be there. Once you have interviewed and want to offer the job to someone, you may wish to make a formal offer before you sign an employment contract. This will ensure that both sides understand the main terms of the prospective employment. You should sent a letter of appointment which summarises the main points of the job offer and asks the employee sign their acceptance of the job. Finally if you don't want the hassle of employing staff, then you can take them on as contractors / freelancers using a contract for services where they invoice you for work carried out and you don't need to deal with tax or national insurance issues. For all these options there is a free template below which you can download and adapt for your business. 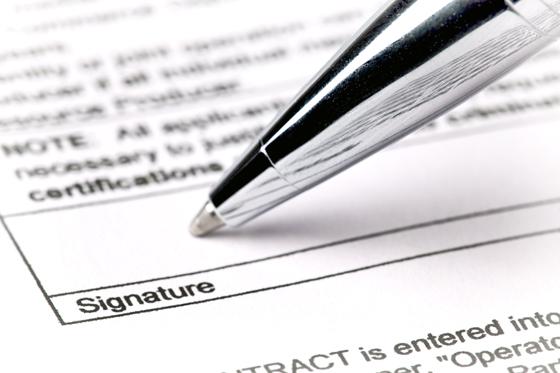 What information should be in the Employment Contract? You can expand on the details of such things as your sickness absence policy, grievance and disciplinary procedures and Company pension scheme in seperate documents or your Employee Handbook if you have one. What Contractual issues do I need to be aware of? 1. You must ensure that you issue the principal statement containing all the elements mentioned above within 2 months of the employees start date. If you fail to do so your employee could make a claim to an Employment Tribunal who could make you pay them 2 - 4 weeks salary as compensation. 2. You must ensure that you pay your employee at least the National Minimum Wage or National Living Wage. The National Minimum Wage (NMW) is the minimum pay per hour most workers under the age of 25 are entitled to by law. The government's National Living Wage (NLW) is the minimum pay per hour most workers aged 25 and over are entitled to by law. The rate will depend on a worker's age and if they are an apprentice. The current rates can be found here. If HMRC find that an employer hasn't paid at least the NMW, they can send a notice of arrears plus a penalty for not paying the correct rate of pay.The fine for non-payment is up to £20,000 per worker. 3. Your full-time employees are entitled to at least 5.6 weeks' paid holiday a year - this is a legal entitlement and cannot be varied. For an employee working five days a week, this equates to 28 days. You can make this either inclusive or exclusive of bank holidays; you can also agree a greater holiday allowance. Part-time employees are entitled to this allowance on a pro rata basis. For casual or irregular working patterns such as in zero hours contracts, it may well be easiest to calculate the holiday entitlement that accrues as hours are worked. You can find out how to do this here. 4. When calculating hours of work, you should ensure that your employee will not be working more than 48 hours a week, averaged over a 17 week period. This is the legal maximum under the Working Time Regulations and also includes work done for other employers. If an employee will be working at or close to the maximum, you should ask them if they are willing to opt-out from the 48 hour limit. If not you must take reasonable steps to ensure that working time stays under 48 hours. Employees also cannot work for more than 13 hours a day and must either have 24 hours' continuous rest per week. Our ebook on "How to Deal With Staff Who Can't or Won't Perform" by Alex Brogan is now available to download. It comes complete with a comprehensive online template resource pack and access to an email helpdesk. It outlines how to deal with all performance issues from staff not being competent to cases of gross misconduct. There is a small charge for this (£4.99) which will support keeping our other resources free. Please note that we update these templates regularly to reflect changes to employment law. Please ensure you sign up for our email update service here or your downloads will go out of date and be inaccurate. This is a combined employment contract and staff handbook template which contains all the information you need to provide to your new employee. It is fully compliant with employment law and best practice, covers permanent, fixed-term and zero-hours arrangements and is suitable for all SME's even if you are only employing one person. There is also a fully completed example for guidance. This is a blank contract of employment which you can download and adapt for your own business. Current British legislation means that all new employees are entitled to such a statement within 8 weeks of commencement. This is a contract template for fixed-term employees, and allows you to specify whether the fixed-term is dependant on time, completion of a task / project, the return of an individual (e.g. following maternity leave) or subject to continued funding. This is a contract suitable for staff who you want to employ on an as-required basis and who do not have any guaranteed hours. Once you have interviewed and want to offer the job, you might want to send a quick letter of appointment. This is how you can quickly offer the job to ensure the individual has all the details they will need to accept the offer and hand in their notice in their current job. Although it does not replace the contract (you will still need this within 8 weeks of their commencement), it is much quicker to produce than the full contract document. A complete set of hundreds of business templates (including Contracts of Employment templates) in one fully integrated product, every document you’ll probably ever need to manage your staff and your business. From £24 for individual theme folders to £49 for the complete package. This is a template which you can use if you are hiring freelance or contract employees. Tool which allows you to create a written statement of employment. Q&A on the basics of employment contracts and further information on drawing up the contract here.